Before becoming a stay-at-home dad, I was lucky to have opportunities to teach children of a variety of ages. I worked with junior high gifted students. I had the pleasure of instructing kindergarteners on how to use laptop computers for the first time. I taught special education in a first grade classroom, co-teaching with amazing teachers. Undoubtedly, my favorite experience was teaching fourth grade. I always thought that my return to teaching would be in a fourth grade classroom. However, as a dad, I have experienced preschoolers for the first time. Each new concept, each new experience, each new book, is exciting! I now think it would be awesome to be a preschool teacher, but for it to happen, I would have to go back to school. I don't know if this will ever happen, but if it did, I know one thing for sure. My classroom library would have numerous copies of Iza Trapani's picture books. Iza Trapani is an author and illustrator of twenty-two books for children. She studied Art at State University of New York at New Paltz with the aspiration of publishing children's books. (Amazon.com Author Page ). Many years passed after her graduation from college before she was able to realize her dream. On Susanna Leonard Hill's Blog she said, "The idea for my first children's book, What am I? An Animal Guessing Game (published in 1992) came to me when I was on a long mountain bike ride twenty-two years ago. When a turtle crossed the trail in front of me, I made up a little rhyming riddle about him. By the time I returned home an hour or so later, I had the book roughed out and some verses composed. I never really thought of myself as a writer until that point. I had a portfolio packed with children's book art but not one story. And then one day (thank you turtle), I tapped into that part of my brain, and after that ideas kept pouring out." Her second book, The Itsy Bitsy Spider, an adaptation and extension of the well-known nursery rhyme, carved out a special place for Iza in the world of children's literature. Iza Trapani described in an interview with Embracing the Child how this career defining book came to be, "My publisher wanted me to do something well known, so we thought about fairy tales then nursery rhymes and we realized that The Itsy Bitsy Spider lent itself well to adaptation and that was selected. When the book came out it became an instant hit and received wonderful feedback especially from teachers and librarians." The book has gone on to sell over 1,000,000 copies (Susanna Leonard Hill's Blog)! The success of this adaptation and extension led to many other books including I'm a Little Teapot, Baa Baa Black Sheep, and her latest The Bear Went Over the Mountain. I was born in Poland where name days (imieniny) are traditionally celebrated more than birthdays (urodziny), although that is changing a bit. There are various dates associated with a given name, and we usually choose one that is closest to our birthday. My name day (Izabella) is January 4th. Celebrations consisted of family gatherings and small gifts, usually candy. They were rather simple - not the big birthday extravaganzas that I learned of once we immigrated to America. We lived in a basement apartment in the home of a Polish family who had a daughter, Ania, close to my age, as well as a newborn son. My mother worked as their nanny and housekeeper. It was there that I became acquainted with American birthday celebrations involving cake and candles and lots of presents. I, of course, encouraged my mother to adopt all these great American traditions such as birthday parties, the tooth fairy, Valentine's day, Halloween, Thanksgiving...and she was a good sport about it. We did not have much money- as she spent much of her earnings on clothing and supplies to send to Poland and saved the rest for our future- but she would stick a dime under my pillow when I lost a tooth, give me chocolate Valentine's hearts, help me with costumes for Halloween, and make my birthday special in some way, even if it was small. One year (I think I was 9 or 10) she threw me my first birthday party. Ania, my friend upstairs and her cousin from next door came, as well as a few of my friends from school. While the details are sketchy, I do remember a beautiful table my mother had set. She was a great cook and wonderful food stylist. Platters of food were decorated with carved radish rosettes, tulips cut out of thinly sliced carrots and beets with whittled green beans for leaves and stems. Hard-boiled eggs she topped with small, scooped-out tomato halves, and dotted with tiny dollops of mayonnaise to resemble mushrooms. Her decorations were whimsical and appealing. While I have no memories of the presents and the birthday cake, I do remember that table and how proud I had felt to show my mother off to my friends. By the way, I have wanted to be a children's writer and illustrator of children's books since I was a child. For many years, before blowing out my birthday candles, my wish was to make picture books someday. Dreams can come true! 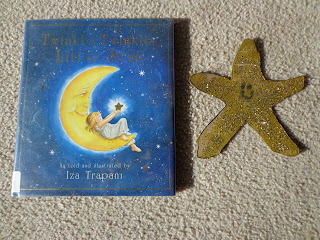 Iza Trapani's Twinkle, Twinkle Little Star and Shoo Fly! 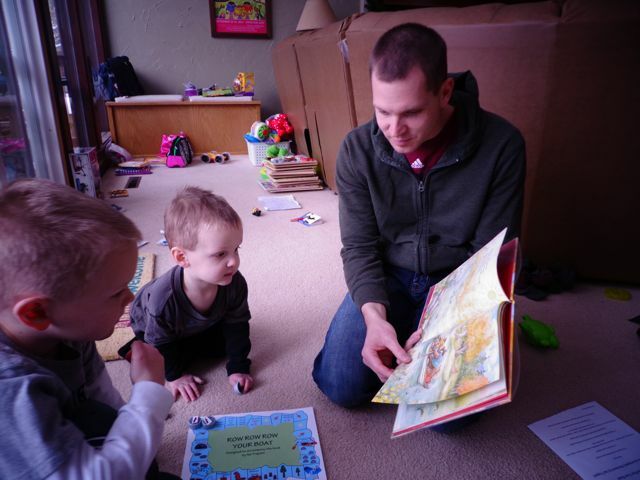 have been favorite before nap time read-alouds for each of my children. I should probably call them sing-aloud books because they start with the familiar rhyme that gets me started singing and then Iza's extended rhymes keep me going. As I revisited these favorites and experienced many new books by Iza this week with my children, I wanted to try to EXTEND her EXTENDED nursery rhyme books even further. To do this, I created nine activities that can be completed after reading Iza Trapani's books. The IZA TRAPANI READING EXPERIENCE allows readers to extend the books beyond the text and pictures, and into reading experiences. Below I highlight six of the nine activities in the reading experience. I hope to get you excited about trying these activities with the preschool age children in your life or sharing them with someone you know. 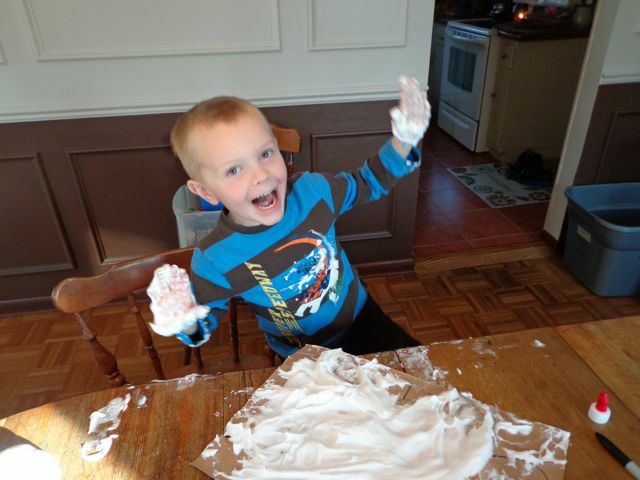 All of the activities are simple, quick and just-right for young children. You will see that we had a lot of fun this week! Click Here to Download the PDF file! It is also available for free on my Teachers Pay Teachers page. 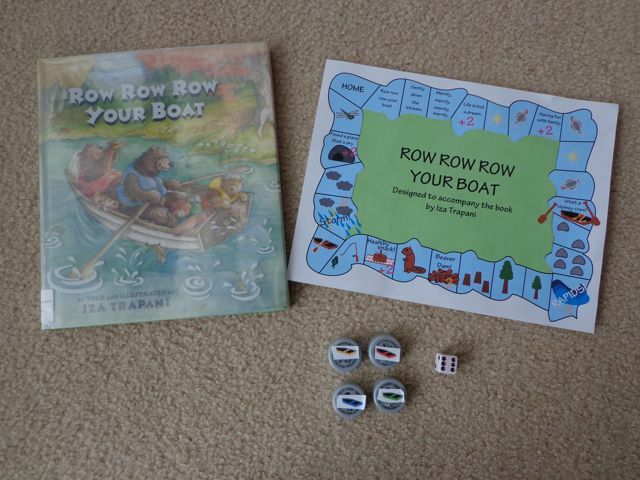 Included in the Iza Trapani reading experience packet is the Row Row Row Your Boat board game. Just print out the game board, make some row boats (we used soda pop lids), and find a die. Then you are ready to play. In the book, you will read about some good things and some bad things that happen to the Bear family as they travel together in their row boat. All the events are included in the board game. Therefore, it can be used as a retelling activity for Row Row Row Your Boat. Be careful - the same unfortunate events that happen to the Bear family could happen to you when your are playing the game. You may have to move back TWO SPACES! 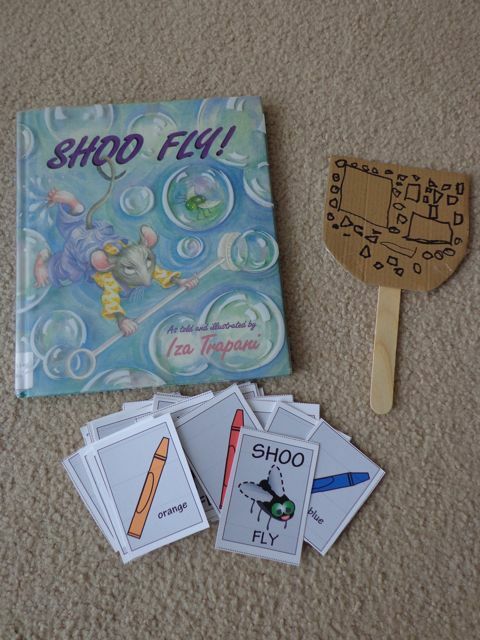 Another activity in the Iza Trapani Reading Experience is the SHOO FLY! card game. We used cardboard and a tongue depressor to make homemade fly swatters. Then, we printed the Shoo Fly and colored crayon cards, which are provided in the downloadable packet. The object of the game is to collect the most cards. You collect cards by swatting the SHOO FLY cards! As the cards are overturned, players are encouraged to say the color name for each crayon. I chose crayons as the image for the other cards because Iza has an illustration in the book of a tired mouse sleeping in a bed after a long day of shooing the fly. The mouse's bedposts are made of crayons! 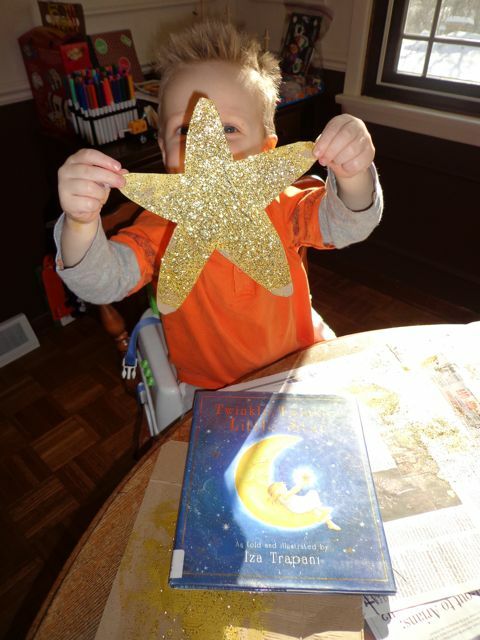 We made Twinkle-Twinkle-Sprinkle-with-Glitter Stars after reading Twinkle, Twinkle, Little Star. This simple activity allowed my children to make glittered stars to hang in their bedrooms. I am still cleaning up glitter, but they loved it! We read Haunted Party too! If you have been following our family, you may know that my youngest son loves Halloween and ghosts! 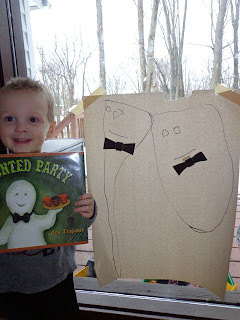 He and I played pin the bow tie on the ghost! 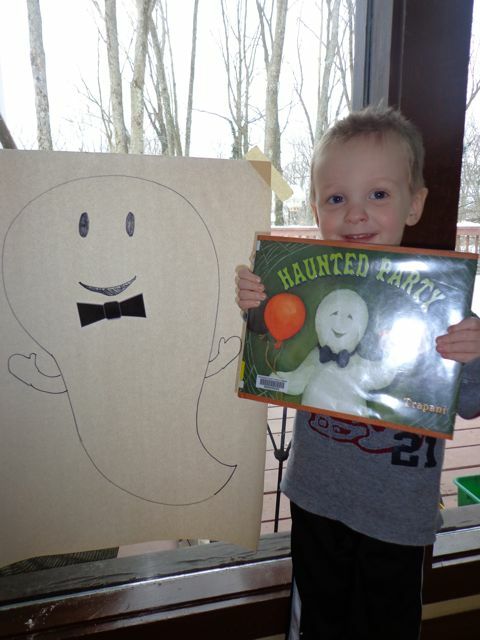 He insisted on drawing his own ghosts. He wasn't even interested in wearing a blindfold. It was fun just to draw the ghosts and put on the bow ties. 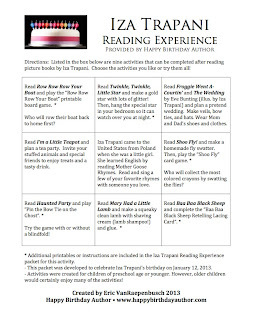 The Iza Trapani Reading Experience packet includes printable bow ties! 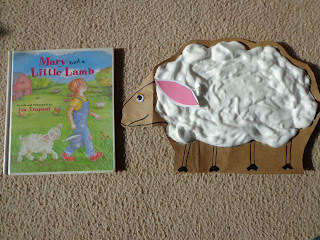 We also read Mary Had a Little Lamb. In this adaptation of the story, the lamb has some troubles on the farm and gets quite dirty. Mary cleans him up with lamb shampoo after a long day. I covered a can of shaving cream with a label that read "LAMB SHAMPOO." 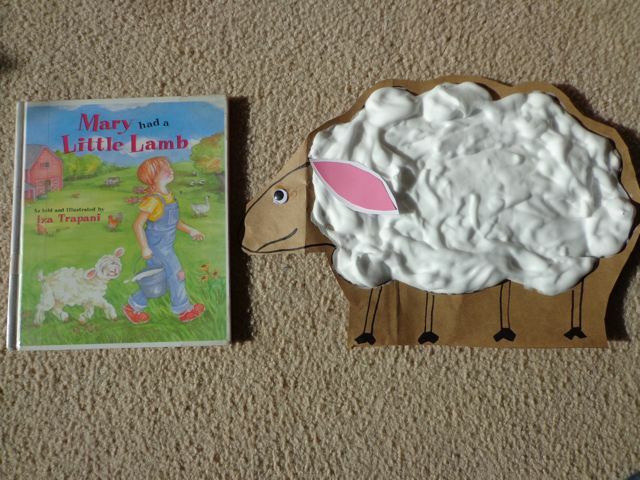 We mixed it with white glue to make these homemade puffy paint lambs. These lambs smell as squeaky clean as Mary's lamb did before going to sleep. This craft is messy and lots of fun! 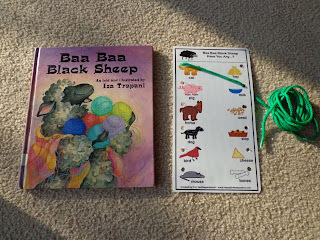 I made a lacing card for Baa Baa Black Sheep. I used this card on two different occasions. Once, we used it when we were reading the story, and we also used after reading as a retelling tool. The printable is included in the Iza Trapani Reading Experience Packet! Check out the Iza Trapani Reading Experience Packet for the other activities that match more of Iza's picture books. There are several other activities to choose from! Iza, my family sends bunches of birthday wishes to you today! We hope you have a wonderful day! Thank you for writing books that allowed my family to have so much fun together! Oh Eric, I am blown away! You have outdone yourself! Wow!!!! Thank you SO much. I always knew you were an extraordinary Dad, but you are also and extraordinary teacher. These activities are amazing! And the pictures of your children are making my heart smile! It is a joy and honor to be featured here. Huge thanks! I am so happy that you enjoyed the celebration! We had such a great time this week! Erik, you blow me away with all the activities you come up with! I have read and love so many of Iza's books. I adored hearing Iza's wish before blowing out birthday candles! Thanks Joanna! I really loved hearing Iza's birthday memories too! Thanks, Joanna! Isn't Eric amazing? Wow! What a great, all encompassing post with activities to boot! Happy Birthday to Iza! She's a favorite at our house! Thanks Laura! I hope you can use some of the activities. Please share the IZA TRAPANI READING EXPERIENCE with those who might enjoy it! Thank you! Please pass the activity packet on to anyone you think would benefit from it! Jama, I'm glad you enjoyed this, and I am in awe of Eric's creativity! WOW. What a party! 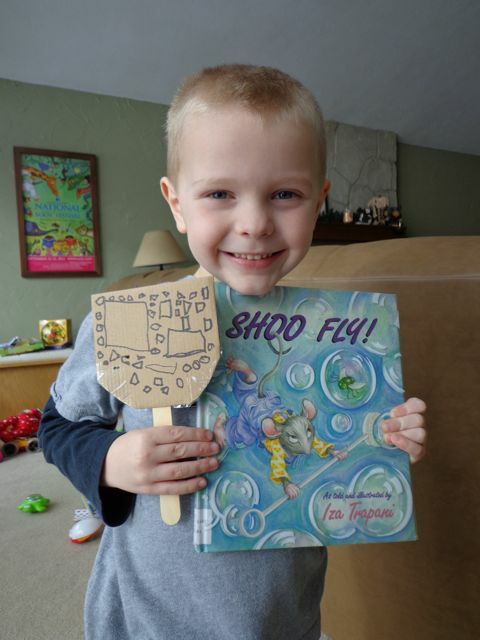 The activities you've created to go along with Iza's wonderful books do them credit, Eric. Looks like a fun time was had by all! Happy Birthday, Iza! I enjoyed reading some more details of your childhood. I'm glad your dream came true. Thanks Dana! It was a fun celebration. I am so happy that Iza shared her childhood birthday memories! Thank you, Dana! I had a wonderful birthday, and I look forward to sharing Eric's amazing activities with parents and teachers! Absolutely delightful tribute to a lovely, charming and talented author. Happy Birthday Iza! I hope the amazing Iza Trapani Reading Experience Packet helps spread word of her work to many, many more young readers! What a great wayo celebrate a birthday.Memories are always sonderful. Love the activities too! It is also a great way to commemorate Iza's bday. Thank you, Romelle! I hope those great activities come in handy for you! Thanks Susanna! Thanks for having such a great blog too -- that was quite a informative interview you had with Iza! Thank you for the kind words, Susanna! I am glad you enjoyed my story. And yes, WOW the activities are fantastic! Eric really outdid himself! Best. post. ever. You have outdone yourself, Eric. This tribute to Iza actually made me teary, it's so beautiful and thorough and fabulous! Those activities are priceless, just like your awesome kids, haha! Just delightful. I'm off to get some lamb shampoo! Thanks Renee! The lamb shampoo label was actually my son's idea! I agree, Renee. Eric did a bang-up job! I am so honored and grateful! I was deeply touched by Iza's story. We all love her work. Whenever you become a preschool teacher, I want to apply for the assistant position in your class. Oh to be under the tutelage Eric VanRaepenbush! These activities and all of your activities are so much fun. Thank you for this thoughtful post. Thank you so much, Pam! And when you and Eric are teaching at a preschool, I will come and visit! Thanks Pam! I would love to have you as my assistant! We would have those kids reading and learning so much! And happy birthday to Iza! Hi Megan! Thanks so much. I had a wonderful birhthday and this amazing post kicked it off! Thanks for visiting the blog Megan! I hope you find the books! Very cool! I love all your companion activities! Thanks, Hannah! Eric did a great job. I hope you put those activities to good use! Ultra Bodacious! I love that! Thanks for taking the time to comment on the blog too. All your compliments mean very much to me! Wow! I'm a little late to the party, but so glad I dropped by. All of the activities are stellar like Iza's twinkling stars. I loved hearing you sing, Iza. Eric...amazing stuff here. Every elementary teacher should be following you and benefiting from your creative skills. Better late than never! Thank you so much for your compliments! Your FREE PRINTABLE OF THE DAY is a great thing to follow on Pinterest!